Honey Meconi is Chair and Professor of Music in the College Music Department and a professor of musicology at the Eastman School of Music at the University of Rochester. Her many books include Pierre de la Rue and Musical Life at the Habsburg-Burgundian Court. 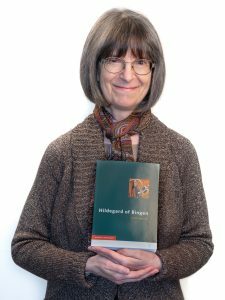 She is a cowinner of the Noah Greenberg Award for “distinguished contribution to the study and performance of early music.” She recently answered some questions about her new book Hildegard of Bingen. Q: Your book serves to rediscover the life and musical accomplishments of Hildegard of Bingen. Who was Hildegard and what inspired you to study her life and music? Hildegard was a twelfth-century Benedictine nun who had extraordinary visions; she wrote about these in a series of theological books, and she used them as inspiration for an extensive series of equally extraordinary compositions. When I was a graduate student, I was asked to be music director for a performance of her musical play Ordo virtutum, which piqued my interest in learning more. Q: What makes Hildegard’s music unique? Hildegard writes in many different styles, depending upon the function of the composition. At her most exuberant, she explores wide ranges, long melismas (single syllables sung to many notes), lots of leaps up and down, and harmonic ambiguity through unexpected pitch choices. She was a poet as well as a composer, so she is setting her own texts to music, and she does an incredible job of matching her texts (which are often very colorful and sensual) to her melodic lines. Very often she will hold a single pitch in reserve, introducing it only towards the very end of a piece. That note makes a big impact when it finally comes! Q: Hildegard has one of the largest repertoires among medieval composers. Why is this significant? Like medieval art, most medieval music (especially sacred music) is anonymous. The composer wasn’t important; it was the work that mattered. So it’s always noteworthy when we have a composer’s name, and that name is usually attached to just a single piece. With Hildegard we have 77 individual songs plus a lengthy musical play that consists of 87 different sections. This is huge! Incidentally, Hildegard would never have thought of herself as a composer. She considered all of her music to be the Holy Spirit speaking through her. Q: Hildegard had a radical view of God and religion compared to her contemporaries. How do they differ? Probably the most significant difference is her treatment of the Virgin Mary. She organizes her music manuscripts by hierarchy, so that the subject matter appears in diminishing order of importance (this is a big contrast to most music manuscripts, which are ordered by the liturgical year). In her first big collection, instead of God the Father, Christ, and the Holy Spirit, which is the normal order of things, Hildegard places her many songs for Mary in second place–she is essentially equating Mary, Christ’s mother, with Christ himself! Now that’s a radical concept, but it does not seem to have bothered modern theologians. Not only has Hildegard recently been declared a saint, she has also been recognized as a doctor of the church, a very rare honor that says her writings are foundational for understanding church doctrine. Q: In addition to religion and music, Hildegard also made great strides in science. How did Hildegard reconcile her religion with science and medicine? 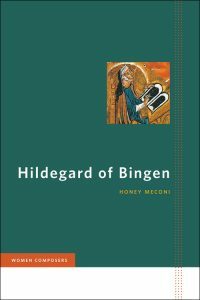 One of the most fascinating things about Hildegard is that she connected all of her creations holistically, whether they were theological, musical, or scientific. While her scientific and medical writings were concerned primarily with aspects of health (e.g., this plant can be used to cure this illness), these cures were interspersed with musings on the nature of the world as God created it, and how the world reveals God’s plans. The Holy Spirit was never far from Hildegard’s thoughts, no matter what she was writing; pretty much everything is imbued with theological insights. And of course nuns and monks were always involved in healing during the Middle Ages. Q: Which of Hildegard’s pieces is your favorite and why? Whatever piece I am performing or studying at the time tends to be my favorite! But certainly one of my top five would be her sequence Columba aspexit. This is a song about St. Maximin, with beautiful poetic language and many rich images throughout. The song has nine sections, the first eight of which are in musical pairs–thus, the musical form is A A B B C C D D, with a closing single section E. I especially love the performance by Gothic Voices, where the first part of each pair is sung by a soloist (the divine Emma Kirkby) and the chorus takes the second part. When you’re singing this and you get to the final “E” section–well, it’s hard to describe that magic feeling of having traversed this incredible musical landscape and coming to the close of all this wonder.